Institutional network maps are shown for different subject areas. The positioning of the institutions reflects the extent of their collaboration activity. Institutional network maps can be coloured by country or citation performance (proportion of highly cited papers). Institutions can be laid out on a world map, in order to reveal geographic patterns of collaboration. Click on individual institutions in order to see how successful they collaborate with other institutions. 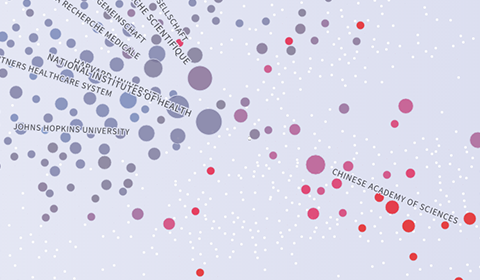 About This web application visualizes how successful universities or research-focused institutions collaborate. The application is based on papers (articles, reviews and conference papers) published between 2011 and 2015 in several subject areas and in “All areas”. For each subject area (and for “All areas”), those institutions (universities and research-focused institutions worldwide) were selected in the SCImago Institutions Ranking which published at least 500 papers in the publication period. We refer to these institutions as "reference institutions". For every reference institution, the collaborating institutions were identified. Collaborating institutions are those which have co-authored at least ten publications with the respective reference institution. We refer to the collaborating institutions as “network institutions”. We estimated statistical models (Bayesian multilevel logistic regressions). The statistically estimated best paper rates (from the models) which the reference institutions have achieved with its network institutions are visualized. The best paper rate gives the proportion of highly cited papers from an institution and is considered generally as a robust indicator for measuring citation impact. Co-authorship networks (based on institutional affiliations) show how successfully overall an institution (reference institution) has collaborated compared to all the other institutions, and with which other institutions (network institutions) an institution has collaborated best. A detailed description of the methods as well the functionality of the application is available in our publication "Excellence networks in science: A Web-based application based on Bayesian multilevel logistic regression (BMLR) for the identification of institutions collaborating successfully" (arxiv, ScienceDirect). Reference institution: A reference institution provides for the ego in the egocentric network. The institution has published at least 500 papers between 2011 and 2015 in a certain subject area or in “All areas” (and is also included in our web application excellencemapping.net for these publication years). 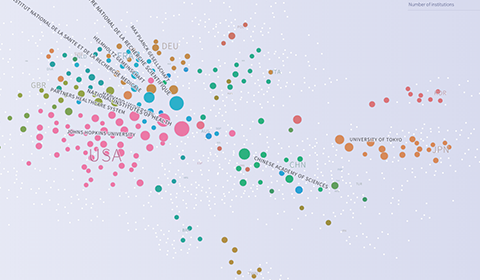 For a reference institution, the network of collaborating institutions can be visualized. For the networks in “All areas”, we additionally restricted the number of included institutions to 564; otherwise, the statistical model had not performed. These institutions belong to the best institutions worldwide in terms of best paper rate or number of co-authored papers, respectively. Network institution: Network institutions appear as collaborating institutions of reference institutions, but their own network of collaborating institutions cannot be shown. Only collaborating institutions with at least ten joint papers with the reference institution are considered. Best paper rate: The best paper rate is the proportion of papers which belong to the 10% most cited papers in the corresponding subject areas and publication years (statistically estimated probability). The application only presents best paper rates of papers published by authors from more than one institution. As the citation impact of papers published in collaboration is commonly higher than the impact of papers published without collaboration, the best paper rates reported in the web application are particularly high. 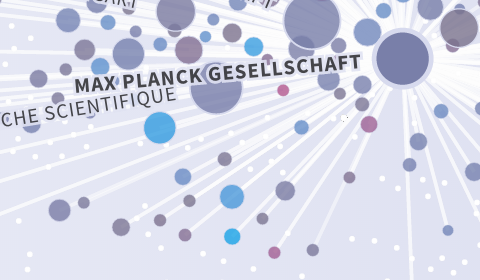 See also our related web application excellencemapping.net which visualizes scientific excellence worldwide in several subject areas and in "All areas". For each institution (university or research-focused institution), the estimated probabilities of (i) publishing highly cited papers (best paper rate) or (ii) publishing in the most influential journals (best journal rate) are shown. Both probabilities can be adjusted by covariates (e.g. the corruption perception index of the countries in which the institutions are located). Contact us at info@excellence-networks.net. We are looking forward to your questions, comments and feedback.